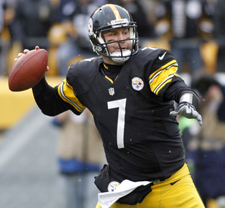 Ben led the Steelers to a 24-10 win over the Cleveland Browns and an 8-8 record on the season. He was limited to just 134 passing yards, but threw three touchdowns – to Plaxico Burress (his first of the season), Antonio Brown, and Leonard Pope in the victory. Go rest a little bit, heal up and get dedicated to come back better than ever. What do you need to do in the off-season? Just get healthy first and foremost. I already started to formulate a plan with [conditioning coach] Garrett Giemont to get better, to get my body better and ready to go. How healthy or unhealthy were you the last few games? Coming back (from the injury), any regrets? Do you get the feeling that a lot of guys are not going to be back? It’s tough. You’re used to seeing a lot of the same faces around here, and to see new guys come in, and then some of the old faces that might not be around…You want everybody back but you know that is not what is going to happen. We hope to get everyone back and wish everyone the best. If you get the nod to go to the Pro Bowl, would you go? I didn’t get the nod. I don’t know if I’m healthy enough to go anyway. You can watch video of Ben’s interview here. You can watch game highlights here. Now the season may be over, but things will still be goin’ strong here at BigBen7.com! Stop by during the off-season to keep up with #7 and his teammates! You can also check us out on Facebook and Twitter too! And if you have a photo or story to share, send it our way! Email us at [email protected]!